Singing into your hairbrush just doesn’t cut it when you know you’ve got the real rock star swagger. So we invited fans at the premiere of HBO‘s gritty new show, Vinyl, to get a little deeper into the rock n’ roll lifestyle. 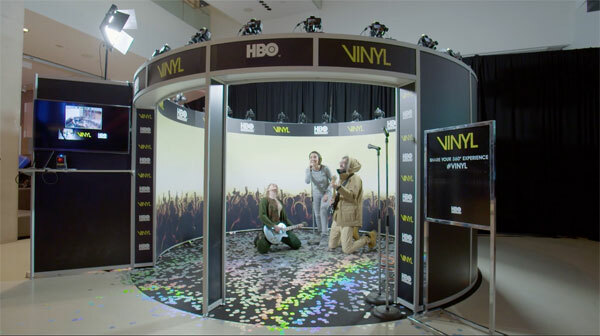 Pixperience created a custom 360 degree photo booth with a branded rock concert backdrop for an authentic, sharable, unforgettable photo experience. Guests stepped in with mics, guitars, and more, and were captured in 360 degrees of hard rock. Brand ambassadors collected guest emails, and photos were available for review within 10 seconds, with sharing options easily accessible. Just like music sounds best on vinyl, our budding rock stars looked best in 360 degrees.